I love the color of mustard, especially in the fall when the weather gets colder and I match the leaves. I'm not so much a fan of mustard as food though. The only exception I'll make is honey mustard for my onion rings. I bet you guys love reading about my love and hatred for mustard. I don't usually like mustard or muted ochre-d colors, but this outfit has made me see the palette in a whole new light! Newest follower! I'm totally smitten with your blog right now. I love everything; the layout, your outfits, the fact that you're a student in New Jersey (Rutgers? ), how adorable you are, the great photographs, your sweet little post on mustard (haha)... Goodness! I adore this outfit. So simple and cute; the sweet bright sweater, the lovely skirt, the charming wedges... So much to love! Cute look! I love mustard yellow too (but not too crazy about mustard either), and I love how you mixed it with your blue skirt! Wow!! I love how autumnal this outfit is. Haha, you have a love-hate relationship with mustard. I hate the way mustard tastes, but love the color on you! You're the second great blogger I've seen donning the color for fall. You look great with that adorable A-line skirt! You look incredible. I'm only beginning my exams this weekend (a timed take-home test online??? Really? ), so I'll know how you feel soon! Thanks for the lovely post. What a great color combination! Those shoes are fab! You know, I haven't been a big fan of mustard until recently when I dared try it on my Jimmy John's sandwich. Imagine my surprise when I actually enjoyed it! But I digress; I'm sure you're excited reading about my opinion on mustard as well. As a color, I really love it, too. 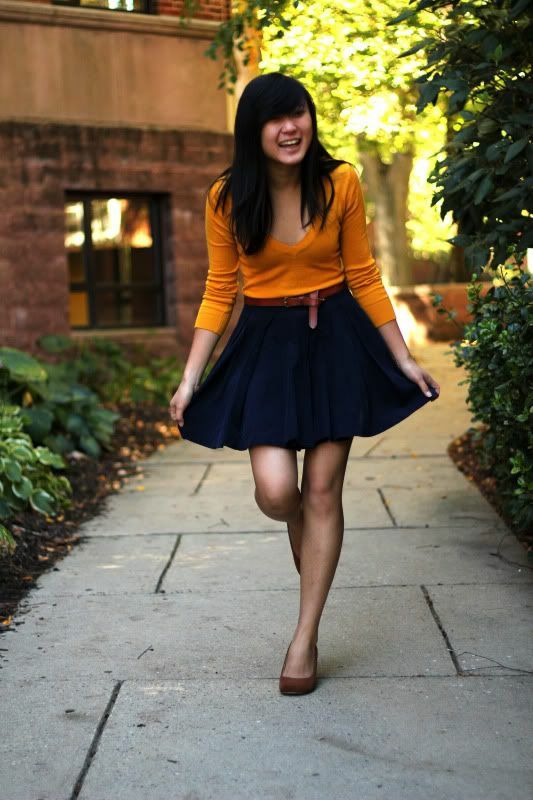 I love how you paired yours with a navy blue skirt-- the colors and silhouette work so nicely! Wow, this is a great outfit! The mustard yellow actually looks more vibrant than the usual shades of it and looks amazing with the navy. Also I love how many ways you've styled those wedges. They look chic and so very comfortable! Perfect Fall colors! I feel like you should be holding a pumpkin here. your legs looks ridiculously long girl! mustard yellow and navy were made for each other :) you look so cute! i recently wore mustard yellow and navy together too (next post actually)! honey mustard with onion rings? now that's something i've never tried! i do love it with chicken nuggets though! Gorgeous! I love this colour on you. you look so incredibly cute! i 'm in love with your skirt..!! so so so so cute..! wow I LOVE the mustard and your skirt is fantastic!!! Lovely colors and great photos!!!! You always have the cutest looks and great photography to go with it...need to remember to stop by more often!!! these are my favorite pictures!! there is fall all over these pictures!!!! You look gorgeous Jen! I love love love the colors you put together! That skirt is fabulous. as i said before, your smiling shot is the best..
and hey, the skirt is fabulous.. i've been looking for that king of skirt but i've not found yet. have fun on your school break..totally deserve it! AWhhhh.. you look ecstatic! It feels like we are surrounded by mustard color in October, love it! The color actually goes so well with the color of your skirt! Again a comment from me, but I love your style! It's exactly what I like and how I should combine the items! I also like the outfits of previous posts! Also you look great on these photos! very classy outfit. i always love mustard, and this skirt is so fun and flouncy. nice pairing! Mustard and Navy are such a great combination. It's a kick of colour with a complementary/contrasty hue. This color combo is simply epic! I love this shade of yellow with navy... just gorgeous. Looks so beautiful and natural with the earthy glow of green leaves behind you. And you anchor the whole look so nicely with shades of brown. Eco-sweet! i heart this outfit. great pics!